Looking at a map, Trieste seams relative close to Rovinj, the distance between the cities is about 100 km, but as the airport in Trieste is situated 45 km outside (Trieste No-borders Airport in Monfalcone) of Trieste in direction of Venice, there is almost 150 km between the airport in Trieste and Rovinj town centre. A distance of 150 km would normally not take long time to travel, but as there is no end to end highway connection, the travel time by car is about 2 hours, and if there is jam at the border it might taken even longer time. Below I have listed “how to” travel between Trieste airport and Rovinj using various means of transportation. Transfer, the most comfortable form of transportation from the Airport in Trieste to Rovinj is a pre-booked transfer, transfer are available in vehicles for 1- 3(4) persons or in larger vehicles for 4(5)-8 persons, you can see prices and pre-book a transfer here. TIP, if you are staying at a Hotel in Rovinj, they might have some prearranged pickup solutions from Trieste airport. By bus, between the Airport in Trieste and Trieste main bus station, there are plenty of buses most weekdays, you can see the connections here, from Trieste bus station to Rovinj, the number of daily departures is limited, you can see timetable here. Travel time by bus is about 4.5 to 5 hours. Taxi, obviously there is of course the option to take a taxi from the airport, if you do so, make sure to agree upon a price before leaving the airport. Travel tip, as the airport bus to Trieste is quite frequent a combination of the airport bus and a taxi or a transfer from Trieste, could keep the travel price and travel time on a reasonable level. 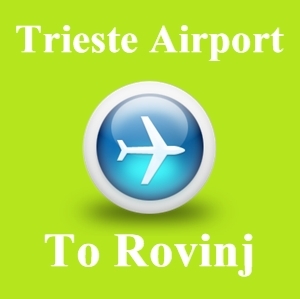 Feel free to leave a comment below if you have any questions about travelling from the Trieste airport to Rovinj.